So back again, to this idea of people having babies all over the place where I work. I was talking with someone last Friday and realized there are at least three people I know who are expecting. I joke all the time that there is no way I will EVER drink the water at work...my kids are getting a bit bigger and I'm thrilled about it! 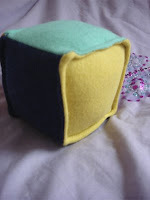 Today's "day off" result was a stuffed cube. It came out much more stiff than Square Meal. 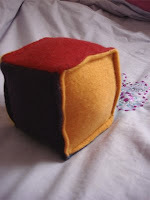 I put some light fusible web inside before stuffing it. I only had two thicknesses at home, so I tried both. The super sturdy was too much...this worked well, but I think I'm going to get some medium stiffness stuff for the next one. 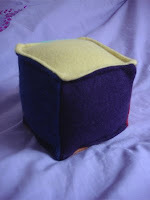 It's super simple, just six 5" x 5" squares sewn together and stuffed. The hardest part was trying to figure out how to get the last seam shut without it looking totally different than the other seams. So I just went around the top and bottom again. If anyone out there knows a trick for that last seam issue, I'd love to hear about it. I had also thought about putting letters on each face, or numbers....something for more contrast. My only concern is that for little babies, it would have to be on super tight. All that chewing and drooling...wouldn't want anything to come off and get swallowed up. I'm already thinking of what to try next. I'm working on a pattern for a reusable lunch bag...back to the vintage raincoats. I got one of the great ones with whales on it right before Christmas. It might even make me want to bring my lunch into work! And I'd be sure to bring my own drink. None of that baby-water for me!